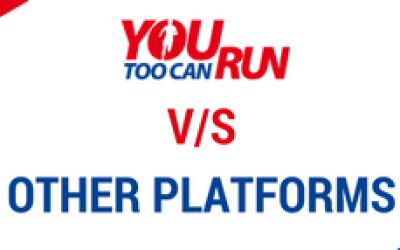 Poorna Daftari, joined the team of YouTooCanRun and was inspired to take up running. 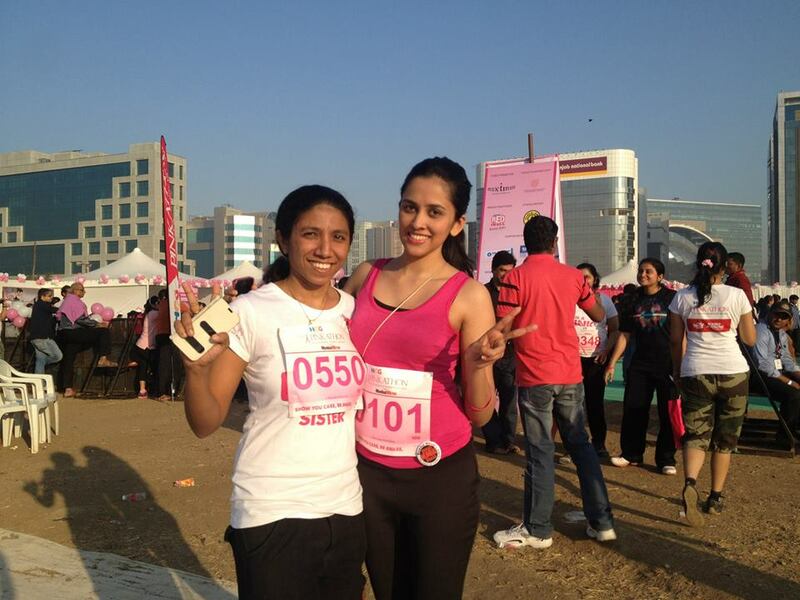 Being a non runner, she aspired to take part in the Pinkathon 10K. With about 7 weeks of training she ran a decent 10Kms. Read her amazing story here. Background : I haven’t been into any sports at all. I have been a dancer throughout my entire school life, also represented my school a couple of times. Also I have been a professional dancer and done a couple of stage shows. I have been into recreational yoga since school too. These are the only extra curriculum activities I have been associated with. When I decided to go running there was no better inspiration and mentor than my boss Mr. Venkat himself. I was really scared of starting it as I knew I had a very bad stamina. But he built up the confidence in me and I decided to do what I thought was impossible for me. Our first day at training we started off with Venkat sir explaining to us in detail about the various aspects about running and also some other important things like pressure on the feet, etc. We took up walking as a warm up and walked comfortably for a good 10mins. Slowly included short distances of running by keeping small goals. Sir was with us throughout, guided us and corrected us about our posture while running. We ended our run with some stretches, which relieved our legs from the little pain that we felt. We ran a good 4.5km on our first day. It was an easy and a refreshing run. It was difficult waking up today as my legs were hurting. But what I realized with time that it was a pleasant pain. Nothing was going to stop me after the past two amazing training sessions. We did a 6km run which was extremely tiring for the 3rd day but obviously I was extremely happy and overwhelmed with my small success!! This day we decided to go without sir. It was a bad idea to run when I was a bit feverish in the morning but I did not want a long break in between my runs so I decided to go. Got a few black outs which was not a very nice feeling. Completed a 6km from Kalina to Asian Heart Hospital, BKC via CST road and back. I had to get up really early because sir decided to start the run at 6am when normally we started at 6.30. We ran 7.5 km which was the most difficult of all the days. Legs hurt a lot but the next morning it was all fine. I guess sleep plays an important part in the pain relieving !! I got up at 6.30 and decided to do a run on my own since it had been a long gap. I wanted to aim at finishing my run in 1hour which extended to 1.15, which I was ok with. I ran a 6.5 km and did not feel any pain or cramps. It was comfortable. I woke up at 5.45 and decided to run to my maximum today. I started at 6.10 am and I went up to Kalanagar via BKC from Kalina. Overall it was a good run to Kalanagar but on my way back I was too tired and I had to walk back most of it. I think I ran 8km in total but walked at least 50% of it which I wasn’t very happy about. I was really tired after the run and decided not to run till the final day. Completed 8 km in 1hour 40min. I was extremely worried about my final day and how I would complete the run. I was just all the time hoping that i shouldn’t be the last one to finish it..! Race Day – 15th Dec 2013On Saturday all I did was attended class and came back home and took rest the entire day. As instructed by sir I ate an early dinner by 8pm which was a normal south Indian meal. My BIB number was really unique- 0101 which I thought was given to me on purpose, it was like everyone knew I was running for the first time !!!! I Made all the arrangements and went to bed by 10 pm. Some how I was too excited and I couldn’t sleep before 11. I Woke up fresh next day at 4.45, ate a light breakfast and hydrated myself a little bit. The weather was extremely good which made me feel even better and energized!! Sir and Jaya picked me up and we reached the venue by 5.45, I was shocked to see so many people there already!! There was very good music playing and the excitement was in the air!! It was a very organized event!! Everybody knew what and why they were there! There was no chaos! The volunteers were extremely helpful! They started with the warm up sessions by the Shaimak dancers which was quite energizing and helpful!! The run started at 6.20 with some really nice dhol walas which made the ambiance extremely exciting !!! I had decided to walk initially for at least 1km in order to warm my body up because that’s what it was used to but because of the excitement I started running and ended up with a cramp on the left side of my abdomen!! Indeed not a good start!! The first, second and third kilometers felt extremely long because of my muscle cramp. I tried to walk-run but it did not help. I decided not to run at all till the cramp faded off completely so first 3-4 kms I ended up walking most of it. As a result I completed 5km in 1 hour. I felt disheartened!! I was very disappointed, wanted to give up when all of a sudden I heard a voice saying “Poorna you are awesome” obviously it was none other than my sir, now all of a sudden I was feeling good!! Hence I decided to pick up speed! After my 5km the route took a turn into the backside of BKC where there were not many lamp posts to count my run and walk in order to make them equal. So I decided to count my steps. I ran 100 steps and walked 50 steps and this I continued throughout my entire last 5km. I picked up pace. I was feeling good. I was being able to over take a lot of people now. I was running with the crowd and not alone anymore. I drank my first sip after 7km and felt damn good, I reached 8km and felt a boost up again! 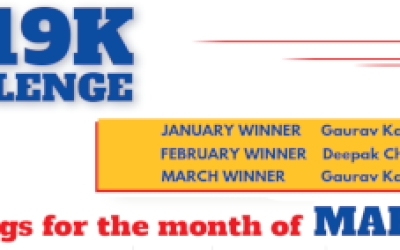 I continued the same count making sure not to increase or decrease it at all! I reached the last 1000m and then felt that I was so close to my achievement ! I ran most of the last 1000m and finished my last 5km in 30mins! Which came to me as the biggest surprise ever because even in my training session I have never hit this speed. I completed my run in 1.30-35 in total (after only 7 Days of training). And I still can’t believe I did it. 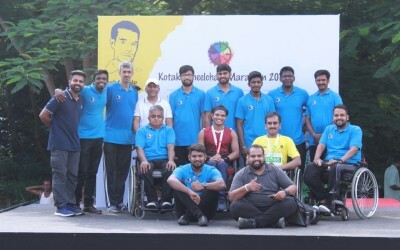 When I was nearing to the finish line I saw a lot of people standing there and cheering which was such an amazing feeling!! On my completion I felt like I was on top of the world and especially after the time I had taken, it had come to me as a big surprise too!! My family called from all over the world to congratulate me and said they were proud of me!! There was no better feeling than that! I Had some biscuits and some really good juice after the run which was much needed, it was provided to us by the event organizers! !The cheering of the volunteers in between the run and the motivation of sir kept me going through out!! I realized how big a part motivation and support plays in a marathon!! Thanks to the volunteers who were motivating a lot of runners!! Poorna has a good background in classical dancing and yoga which is a positive. Dancing does improve the aerobic capacity though it does not deal with the specificity of running. Which means that the legs muscles which are used for running are not exercised well enough in dancing. Being a dietician she has a basic grounding in training physiology, which is a plus. Being young and having very lean body mass the training load was rapidly increased. 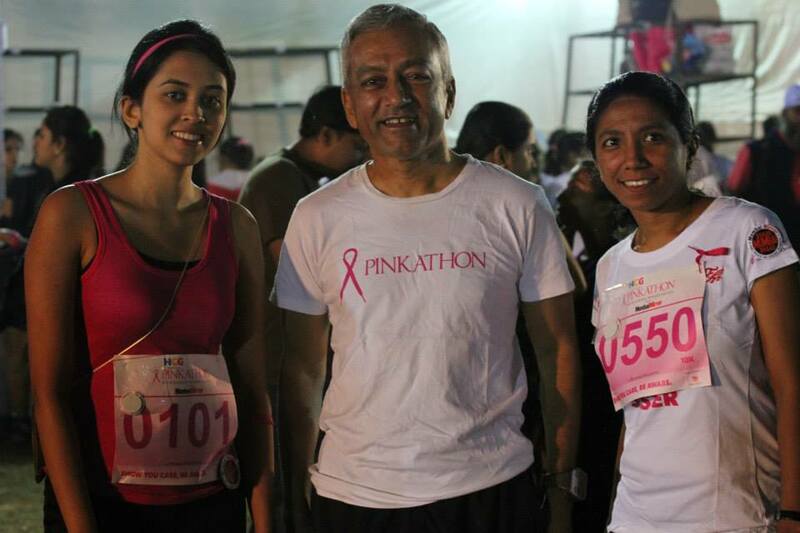 In normal circumstances I would not have done this but I wanted both of them to have the thrill of taking part in the Pinkathon 10K distance. Kudos Poorna! Ventak sir is an inspiration and the best ode to him would be if others reading your feat, tie-up their shoelaces and pound the pavement. Well Done. 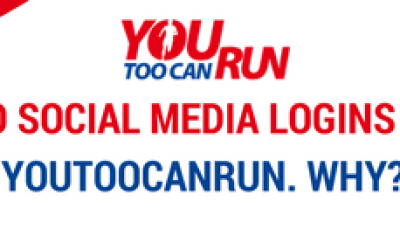 And hope to see you on some of the other running events in Mumbai. Here’s wishing you many more miles and many more smiles! !